Today, I'm reviewing one of the new products in the market called Hypersharp Liner Laser Precision by Maybelline. Eyeliner is one of the earliest products that I have when I started wearing makeup. I'm pretty sure we are all had one oldie eyeliner right? I must say eyeliner was a hit back then because it is one of the easiest thing that every girls can do. Draw a stroke. Make it more flirty added a little winged called 'CAT EYED effect'. But, we are all experienced the same nightmares. Super heavy thick eyeliner and a dark black 'blunt' winged.Urgghhh I don't even want to flashback. But that is the reality. As the eyeliner industry revolved and getting better and better. 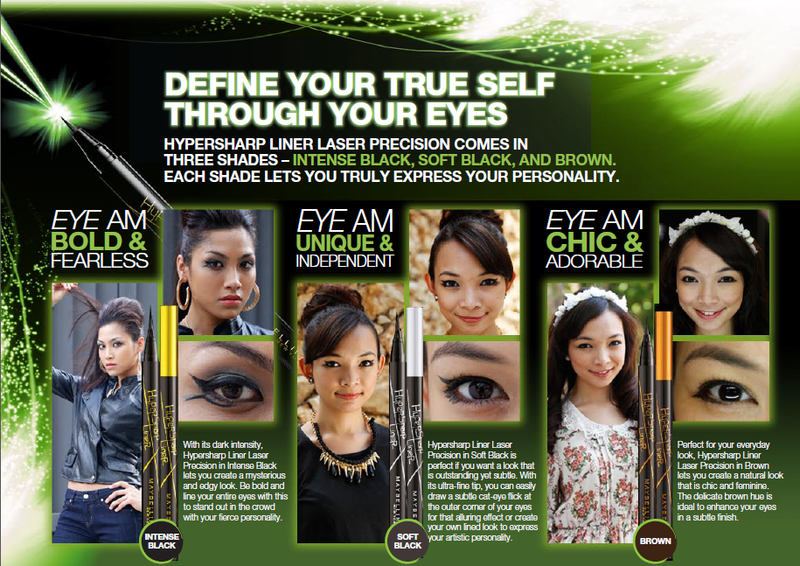 Maybelline, the No 1 eyeliner brand in Malaysia knows well the struggles that we have. Maybelline created the new Hypersharp Liner Laser Precision with a tip that is only 0.01mm (first in Malaysia from Maybelline New York) created to give you a better control when applying eyeliner. I love the packaging of this eyeliner. It is super sleek looking and the cap is a copper color. Bonus! The size of it is almost similar with my pen and ever since I have it, I put in in the pocket of my handbag and it sits perfectly in there. The ultra fine tips is the one that makes this eyeliner so special. I think this is the most practical eyeliner that I have ever tried in my life. 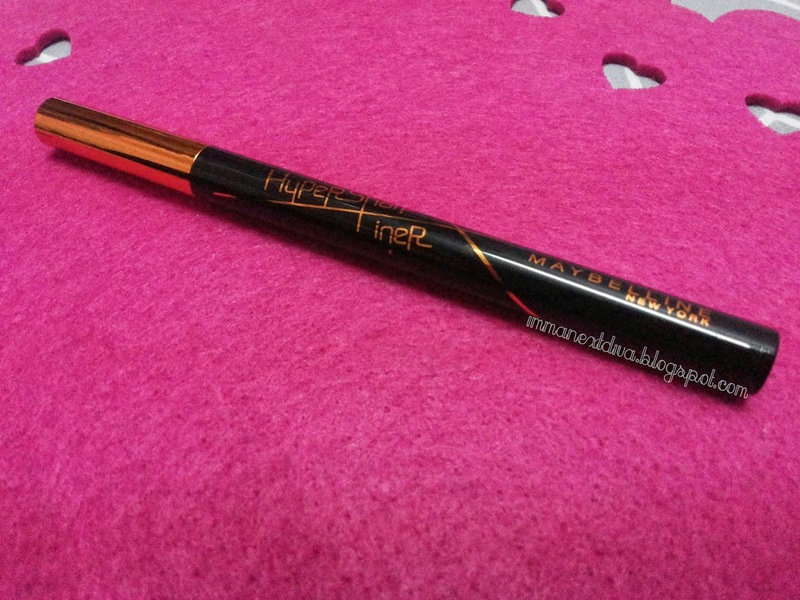 I used to love my Maybelline Hyperglossy Liquid Liner because liquid eyeliner glides smoothly on my upper lash line but to control it, it is a bit tricky. 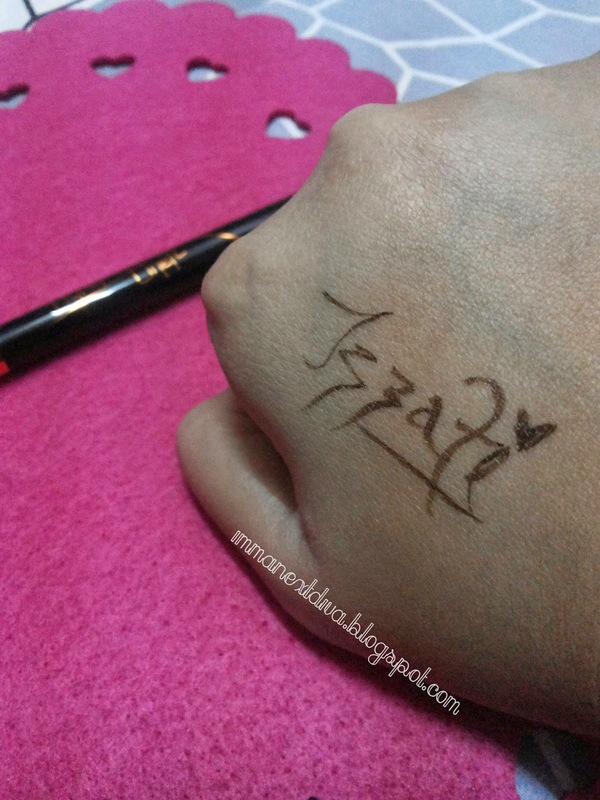 Surprisingly, this eyeliner has the same effect as liquid liner does but better! 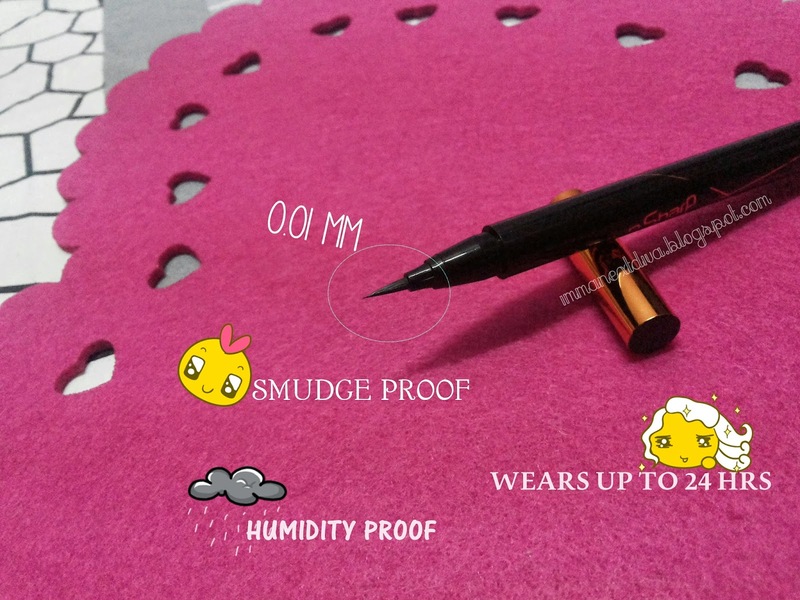 The pen-like body makes it so easy to control and the tips created the most perfect winged eyeliner in my life. The small precise fine tips also helps us to fill in any small gaps in between our lashes to create an illusion of full and volume lashes effect. 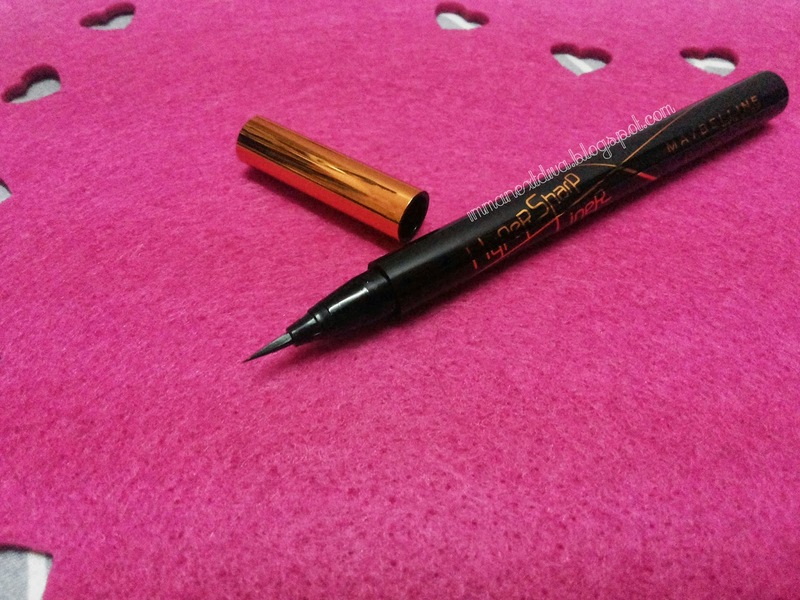 Maybelline Hypersharp Liner Laser Precision has 3 color selections which is Brown, Black and Soft Black. Here is my demonstration with the liner on hand. 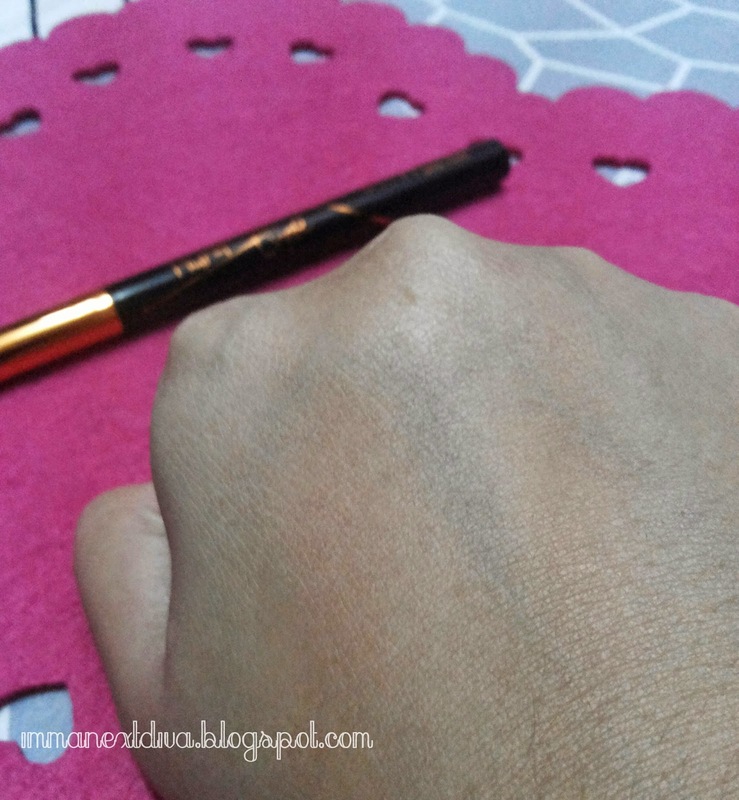 The reason why I tested it on the back of my hand is because I I want to rub and smudge it really hard. If I tested on my eyes it could irritate and tug my eye area and that is the last thing that I want. But seriously, do you rub you eyes real hard? If you do, PLEASE STOP!!!! 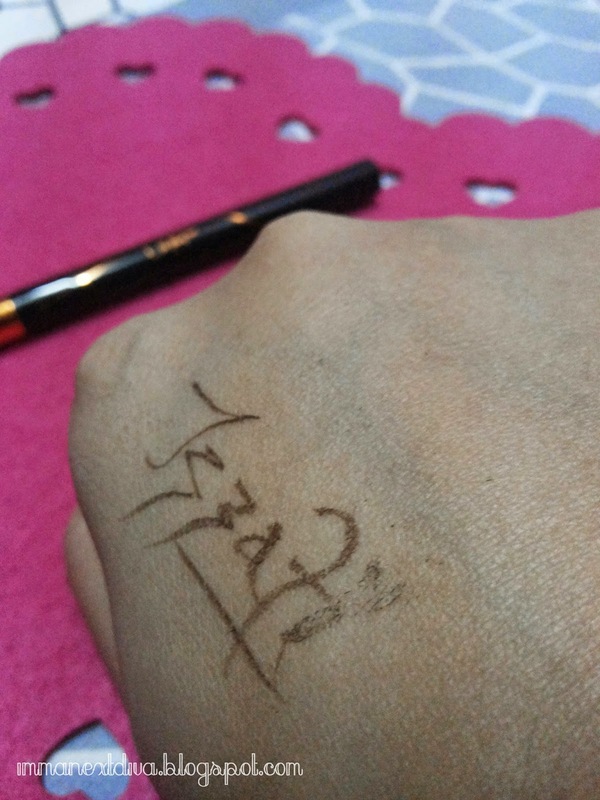 The beauty of this liner is the bristles or the tips is fine and I can even do signature and draw my name. I rubbed it really hard and as you can see only 10% of the liner is disappeared. WOWWWW! Thanks to a unique hyper-coating polymer that inspired by mascara. It is surprisingly so easy to remove this eyeliner. Just using you tap water it totally comes off like a dream. If you wear it alone, you don't need any makeup remover. I can perform my solat with ease without have to worry about the residue of the liner on my face because the water removes it all. I love this eyeliner so much. The brown color gives me a subtle and nice winged. I never had any brown liner on my top lashes. But I enjoying having it with this liner. I recommend you to try this Maybelline Hypersharp Liner Laser Precision eyeliner with The Rocket Volum' Express Mascara and the result is THE BOMB!! Maybelline Hypersharp Liner Laser Precision eyeliner is available from June 2014. Availibility: Watsons, Guardians and any superstores that carry Maybelline brand. **The product was sent to me for review. Opinions are 100% on my own. ***If you read this, comment Unicorn eats rainbow popcorn!